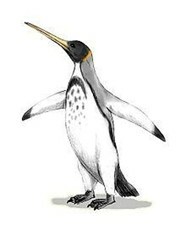 The penguin is an aquatic, flightless bird mostly found in the southern hemisphere. Because the designer of this airplane device knew that this machine would never fly it was given the penguin name! The aileron, elevator, and rudder surfaces and controls on this device are a close mimic of a real airplane as are the controls that are in the cockpit. 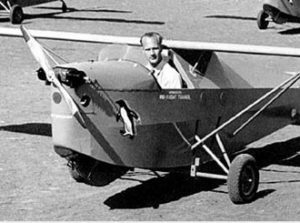 The device was invented to permit fledgling pilots to attain ground taxiing skills without risking expensive damage and repairs to the real airplane. The trainer is too underpowered to fly, but it did approximate a real airplanes’ ground handling characteristics. The instructions and plans for building this device were actually published in the 1932 Flying and Glider Manual so that a home builder could make one for themselves. The way in which the device was used was as follows: After buckling into the machine a helmet was placed on the trainee. After the engine was started the trainee would attempt to navigate a specified course that was laid out in a large open field area. It was apparently important for the trainee to master applying full throttle and get the tail up off the ground. Then, by skillfully using the rudder, the device was navigated over the prescribed ground course. While in transit the ailerons would be used to keep the wings level and parallel to the ground. A set of observers would score the trainees’ proficiency in handling the device and the exercise would continue until it was felt that the skill level of the trainee was of a competent level to use an airworthy aircraft. My father designed and made the first five engines (2-S-17) for a Pre-Flight Trainer for Volmer Jensen ‘The Penguin’ (sic. 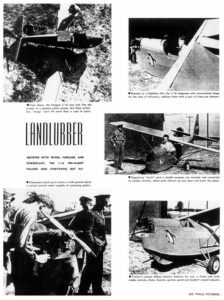 ‘a bird that cannot fly’) …see “landlubber” article from Air Trails magazine circa 1944.